With news headlines getting ever weirder and more worrisome, I recommend daisies. There’s nothing quite so charmingly uncomplicated as a daisy and there are so many ways you can make the world a better place with them. Give someone a daisy bouquet. Wear a pair of $800+ daisy and gold glitter heels. Plant them in your garden or stick ’em on your garden party invites as Canada Post is suggesting. I’m sure you know what you need to do if you fancy gifting or wearing them so here are some not-so-obvious gardening ideas with some unexpected daisies. Canada Post’s annual spring flower stamp issue, on sale now (spring, 2017), features two varieties of cute-as-a-button daisies native to parts of Canada. (And, wouldn’t you know, the liner of the 50-stamp coil is printed with the lyrics of Harry Dacre’s 1892 classic song, Daisy, Daisy). Both daisies have unique qualities that can be ideal for gardens–though one might be tricky to find. 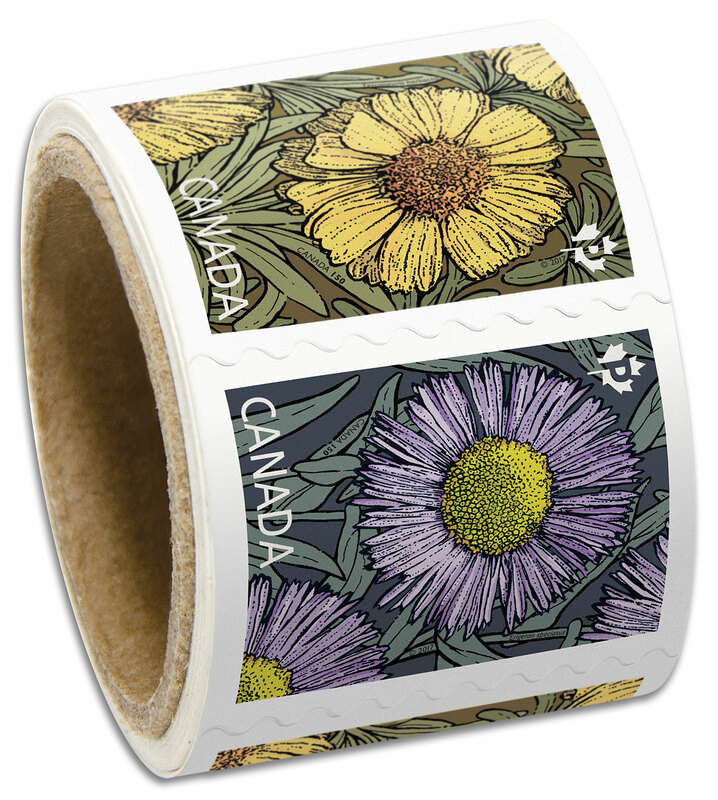 Part of Canada Post’s annual flower issue, these stamps feature yellow lakeside daisy (Tetraneuris herbacea) (shown at top of photo) and lavender showy fleabane (Erigeron speciosus) (shown at bottom of photo). Photo courtesy of Canada Post. THE TINY ROCK STAR: Lakeside Daisy (Tetraneuris herbacea) also goes by the names Stemless Rubberweed, Sundancer Daisy and Manitoulin Gold. Calling these bright yellow sweeties stemless sounds harsh but there’s no denying they’re height challenged. The plant’s small rosette of strappy, dark green leaves grows only to about 3″ in height although the flowers top stems growing up to 6 inches. Having a habit of growing between cracks in boulders make these darlings ideal for rock gardens or as surprising additions to a display of stone troughs. The Ontario Rock Garden & Hardy Plant Society reports that this plant is “easy to grow” but you’d have to score some seeds first. I couldn’t find a supplier online. Let me know if you get lucky. If you do, you’ll be doing your local wildlife a favour. These plants are known to be very popular with bees (including bumblebees, small carpenter bees and Halictid bees), beetles, butterflies, and skippers. THE NOT-SO-WILD WILDFLOWER: Lavender showy fleabane (Erigeron speciosus) goes by other, equally unglamorous names like Aspen fleabane and Fleabane daisy. You might argue that this plant looks more like an aster but bear with me (and Canada Post). It’s found in the wild in meadows and open woods of foothills in B.C. and Alberta as well as parts of western U.S. Considered a subshrub, its leafy, erect stems grow from a woody base to upwards of three feet in height and sprout leafless stalks supporting lavender blooms (though this plant has been known to have pink or white flowers). For a real wildflower, this plant behaves beautifully in the middle or back of a perennial border. Plant in full sun with dry to moist soil and watch it attract bees and butterflies from the height of summer into fall. Find seeds at Wild About Flowers and the VanDusen Botanical Garden. Maximillian’s Sunflower, also known as Michaelmas-daisy, (Helianthus maximiliani) growing in the garden at Wildflower Farm near Coldwater ON. 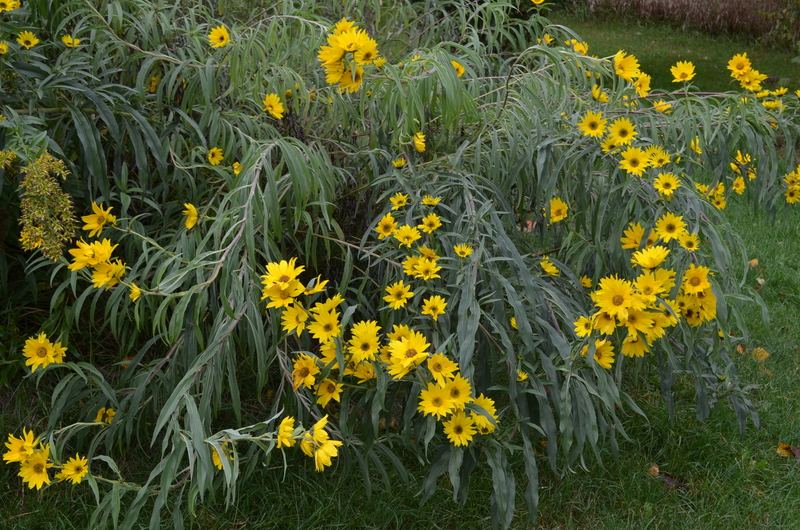 Maximillian’s Sunflower (Helianthus maximiliani) is also commonly referred to as Michaelmas-daisy. Confusingly, several other daisy-like flowers are also called Michaelmas-daisy but the main thing to remember here is that they all share one thing in common: blooming prolifically through fall. (The Christian festival of Michaelmas falls in mid-autumn, this year (2017) on September 29th.) Maximillian’s Sunflower is a prairie perennial native to British Columbia, Manitoba and Saskatchewan (although it has naturalized in other parts of southern Canada including Ontario and Quebec). It also occurs in parts of central and eastern United States. This stand-out daisy can grow over 6 feet tall. Towering unbranched stems with long, narrow leaves are bedazzled with three-inch-wide blooms from August to November. Although it’s found growing naturally in mixed grass prairies and disturbed areas like the banks of ditches and prefers moist, clay-like soil, it’s not particularly picky in the urban garden (hardy to Canadian garden zone 3) tolerating sandy, loam or clay loam that’s either moist or dry. One caution, though: if you have rich soil, the plant may produce weaker stems that will require staking. ON SLOPES: If you’re gardening on a slope, this plant can help prevent erosion with its rhizomatous root system which will spread, creating an underground network that knits together clusters of plants. FOR PRIVACY: It can grow tall and dense enough to use as a hedge or in addition to other plants in a mixed hedge. You can also use it to make a striking privacy screen. TO SUPPORT LOCAL WILDLIFE: Birds eat the many seeds it produces, bees and butterflies use it for cover and honey bees rely on its nectar. Butterfly caterpillars feed on the leaves. TO MAKE A SPECTACULAR NATIVE BANQUET: Two other native plants naturally found growing with Maximilian’s Sunflower are goldenrod and milkweed. Planted together, this trio will not only look spectacular, it will make a sensational wildlife support station. Find seeds at Wildflower Farm. In my next post: An easy container recipe showcasing a new-for-2017 classic white daisy that blooms from spring to fall.